Sherry is the honorary co-chair (with Suzanne Goin of Lucques, A.O.C. and Tavern) of C-CAP’s Sweet & Savory Spectacular Benefit set for Sunday Afternoon, Oct.,19th at The Art Institute’s campus in Santa Monica just above the airport. 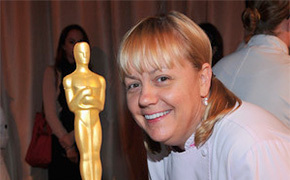 Both of Sherry’s current projects, iPic Theaters and Helms Bakery, will be serving distinctive tastes from their menus. Sherry serves on the Los Angeles Advisory Board of the Careers through Culinary Arts Program as well as on the National Board. C-CAP provides at-risk high school students with culinary arts training. The best-of-the-best of these students compete for culinary scholarships to the top schools. In Los Angeles alone some $600,000 is scholarships were awarded this year! These promising students are the career hospitality people of tomorrow. This entry was posted in Podcasts, SoCal Restaurant Show and tagged A.O.C., C-CAP, Careers through Culinary Arts, culinary scholarship, Helms Bakery, iPic Theatres, Lucques, Naan-chos, OMG Cookie, Pastry Chef, podcast, Sherry Yard, Suzanne Goin, Sweet and Savory Spectacular, Tavern by abell. Bookmark the permalink.